In December I told you about a hat I'd cast on for myself. All the details of which are here. 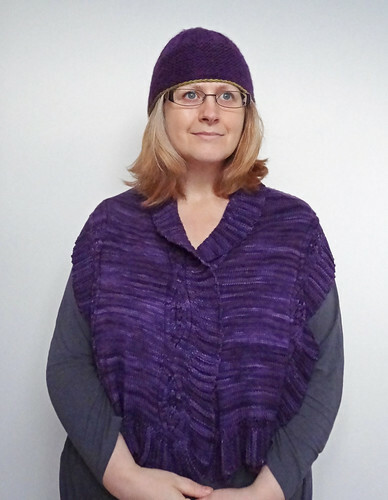 In that post I told you that I had knit it to go with a new purple scarf/shawl that I'd made, but had never told you about. 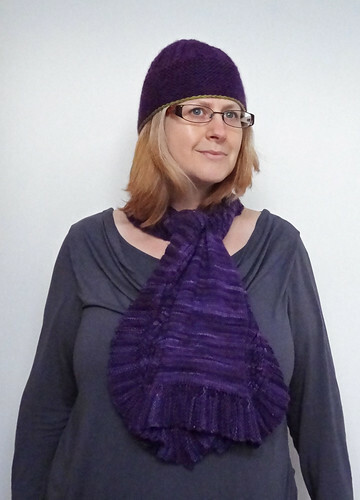 In this post I will show you the finished hat and tell you about the lovely stole I made. Firstly, the the shawl was a test knit that I jumped on board as soon as I saw it. It's a pattern by Marjorie Dussuad, called Fluvial. 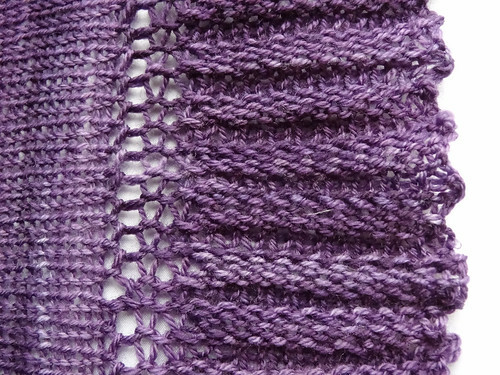 The pattern uses two skeins of Malabrigo Sock Yarn, which is one of my favourite yarns. It is merino yarn, so it's gorgeously soft, and it is also beautifully dyed in sumptuous colours. I used Violeta Africana, which is a yummy purple colour. I had to use two different dye lots because I already had one of the skeins and bought another one to match it. Because I had two dyelots I decided to alternate the skein I knit with, every two rows. This means there is less of a hard line where the skein changes half way through. It also stops the pooling of the colours in the yarn being too dominant. 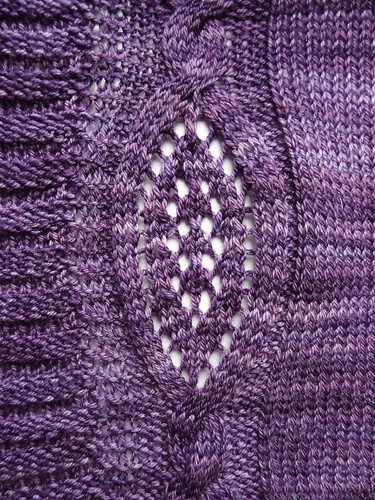 I was attracted to this pattern because it has both cables and lace - my two favourite things! The stole is nice and and broad, and can be folded over lengthwise to make a scarf, or left open to make a stole. I love everything about this stole, from the yarn choice, to the garter ribbing that is knit as you go. I wear it a lot. 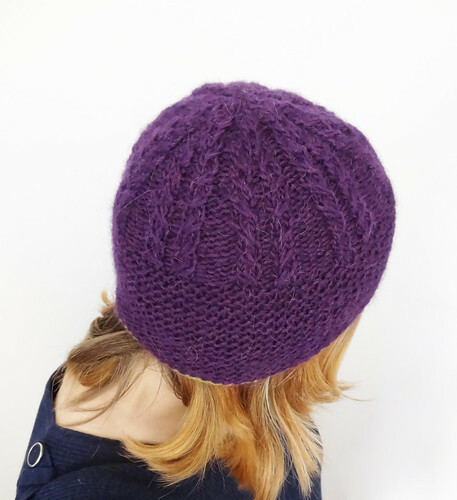 This is why I felt compelled to knit a matching hat, besides there was a distinct lack of purple in the headwear department of my accessory wardbrobe. I am so glad I added that cast on row of contrast colour with this hat. It really pops and means I can wear it with my green cowl. The hat is a little short for my liking, even with the extra short row shaping to bring it down over the neck and my ears. I imagine this is because I didn't swatch - ooops. But it still looks ok, even if my ears aren't as warm as I had hoped. I really like the cabling, but I think that it is lost with this yarn, which is a bit hairy. 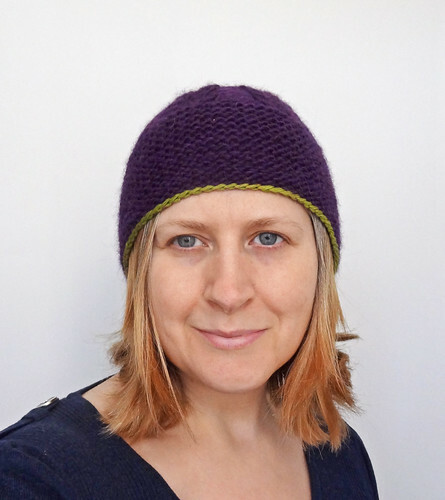 I am tempted to knit this hat again but in a nice plump and rounded merino or merino blend. I think the cabling would "pop" more. 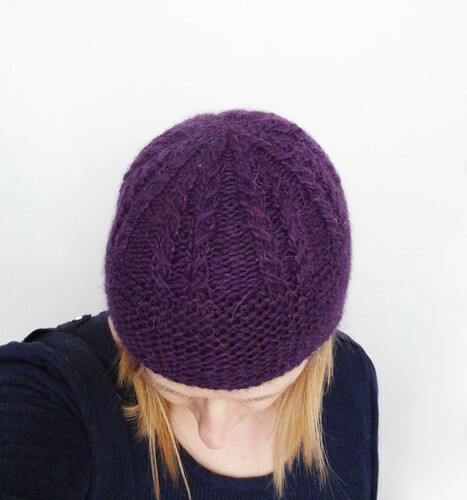 I do like the deep garter stitch brim to the hat, and that, more than anything, is what attracted me to this hat. I do love garter stitch! So now, I have to show you the two items worn together, as they were supposed to be. I love how versatile this stole is. I often wear it as a scarf. In slightly milder weather I wear it like a stole under my coat, with the ribbed edging curling up around my neck like a cowl neck sweater. As the stole is knit in sock yarn it isn't heavy, it just provides an extra layer of warmth, which can stay round my shoulders if my destination isn't too warm. 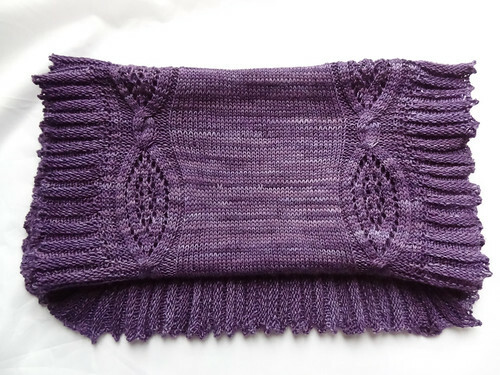 I really enjoyed knitting Fluvial, it is a lovely pattern and well written. I highly recommend it, as I do the hat pattern. 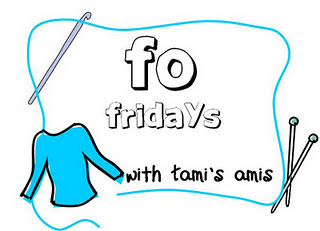 I'm linking up to Tami's FO Friday, where you can see other finished projects by clicking on the button.